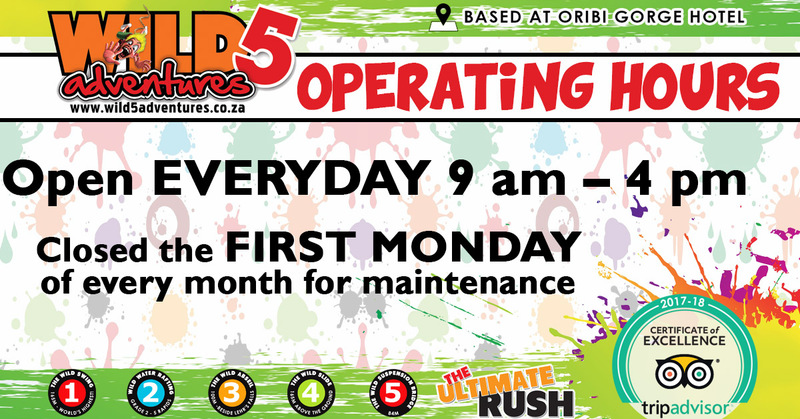 Ladies half price this Women’s Day on the Wild Slide, all day long 9 August 2018. Be a lady with a little bit of wild this Women’s Day! 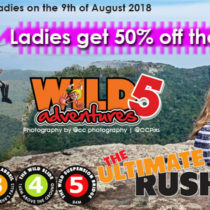 Ladies receive a gorgeous 50% off the Wild Slide! 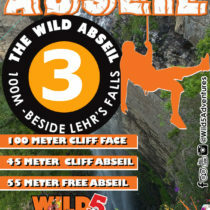 This entry was posted in Our Wild World and tagged 50% discount, abseil, activity, adrenaline, amanzimtoti, august, best price, celeb challenge, celebrate, family fun, free, half price, ladies only, margate, outdoor activities, port shepstone, south coast, what to do durban, what to do south coast, wild slide, wild swing, woman, womens day on June 20, 2018 by Wild 5 Adventures. 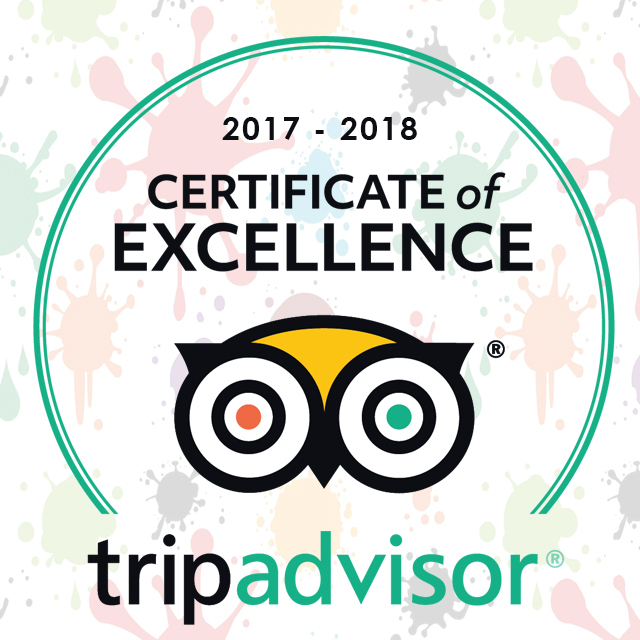 It’s the Easter holidays and we have just the perfect activities to keep you busy and entertained. 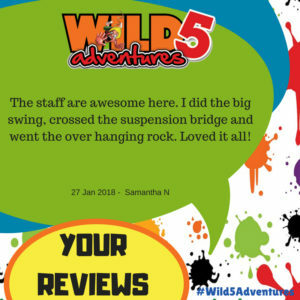 Experience the ultimate rush on our Wild Swing, Abseil, zipline, or suspension bridge! 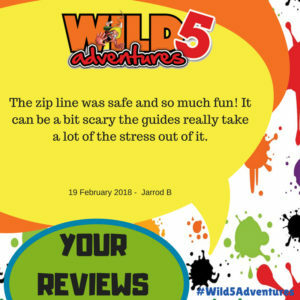 This entry was posted in Our Wild World and tagged abseil, activity, adrenaline, bungee jump, celeb challenge, easter, entertained, family fun, margate holiday, outdoors, ramsgate, south coast holiday, southbroom, what to do on March 7, 2018 by Wild 5 Adventures. It’s Wild Will’s 20th birthday this month! 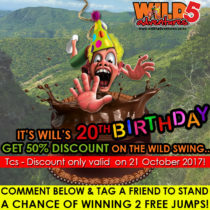 To celebrate, we are offering a MASSIVE 50% DISCOUNT on the Wild Swing for the entire day on Saturday 21 October 2017. 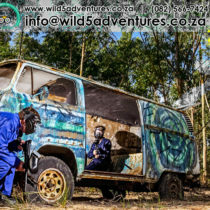 This entry was posted in Announcements and tagged 20th birthday, activity, adrenaline junkie, amanzimtoti, birthday, birthday celebration, celebrate, extreme, free, margate holiday, oribi gorge, outdoor fun, outdoors, ramsgate, south coast, south coast holiday, what to do durban, what to do south coast, wild 5 adventures, wild swing, wild will, win on September 28, 2017 by Wild 5 Adventures. 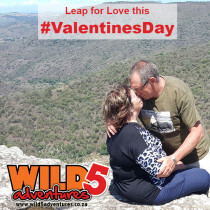 Bring your significant other to do the #WildSwing and your partner gets to jump for FREE! 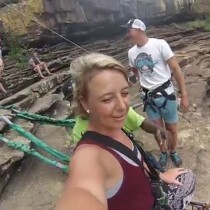 This entry was posted in Announcements and tagged activities, activity, adrenalin, adrenaline, adventure, amanzimtoti, bungee jump, couples, couples activities, durban holiday, family fun, free, holiday, jump for free, love, margate, margate holiday, oribi gorge, outdoor activities, outdoor fun, port shepstone, ramsgate, shelly beach, south coast, south coast tourism, southbroom, valentine gift, valentines, valentines activities, valentines day, what to do durban, what to do for valentines day, what to do margate, what to do south coast, what to do southbroom, wild 5, wild 5 adventure, wild swing on January 27, 2016 by Wild 5 Adventures. 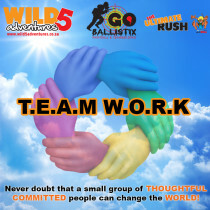 This entry was posted in Wild 5 Team Building and tagged activities, activity, adventure, best company, best team, build company, build motivation, change, company fun, company team building, hands, how to do team building, margate, motivated, oribi gorge, port shepstone, ramsgate, shelly beach, south coast, southbroom, successful, successful team, team, team building, team building beach, team building durban, team building south coast, team work, teambuilding, tourism, uvongo, what to do team building, wild 5, wild 5 adventure, work on September 22, 2015 by Wild 5 Adventures. 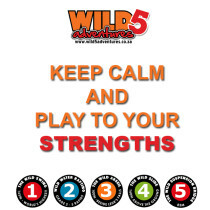 This entry was posted in Wild 5 Team Building and tagged action packed, activities, activity, adventure, best team building, custom packages, durban tourism, keep calm, margate team building, play to your strength, south coast, south coast tourism, team building, team building durban, weakest link, what to do durban, what to do kzn, wild 5, wild 5 adventure on September 4, 2015 by Wild 5 Adventures.